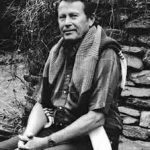 One of the twentieth century’s most acclaimed American poets, Richard Wilbur has received the Bollingen Prize, the National Book Award and two Pulitzer Prizes. He also served as Poet Laureate and has translated many plays and poems from the French. He first delivered “Poetry and Happiness” as a lecture at Washington and Lee University, and it was subsequently published in Shenandoah. I am not perfectly certain what our forefathers understood by “the pursuit of happiness.” Of the friends whom I’ve asked for an opinion, the majority have taken that phrase to mean the pursuit of self-realization, or of a full humane life. Some darker-minded people, however, have translated “happiness” as a material well-being, or as the freedom to do as you damn please. I can’t adjudicate the matter, but even if the darker-minded people are right, we are entitled to ennoble the phrase and adapt it to the present purpose. I’m going to say a few things about the ways in which poetry might be seen as pursuing happiness. The eccentric propositions of its fate. But “poetry” may also mean what we more usually mean by it; it may mean verses written by poets, imaginative compositions which employ a condensed, rhythmic, resonant, and persuasive language. The second kind of poetry is not unconnected with the first; a poem written by a poet is a specific, expert, and tributary form of the general imagined activity. Nevertheless, I should like to begin by considering poetry in the second and restricted sense only, as referring to verse productions written by individuals whose pleasure it is to write them. Back in the days of white saddle shoes and the gentleman’s grade of C, college undergraduates often found that they had an afternoon to kill. I can remember killing part of one afternoon, with a literary roommate, in composing what we called A Complete List of Everything. We thought of ourselves, I suppose, as continuators of Dada, and our list, as we set it down on the type-writer, amounted to an intentionally crazy and disrelated sequence of nouns. A section of our list might have read like this: Beauty, carburetor, sheepshank, pagoda, absence, chalk, vector, Amarillo, garters, dromedary, Tartarus, tupelo, omelet, caboose, ferrocyanide and so on. As you can imagine, we did not complete our list; we got tired of it. As in random compositions of all kinds – musical, pictorial, or verbal – it was possible to sustain interest for only so long, in the absence of deliberate human meaning. Nevertheless, there had been a genuine impulse underlying our afternoon’s diversion, and I think that it stemmed from a primitive desire that is radical to poetry – the desire to lay claim to as much of the world as possible through uttering the names of things. A catalogue of that sort pleases us in a number of ways. In the first place, it stimulates that dim and nostalgic thing the olfactory memory, and provokes us to recall the ghosts of various stinks and fragrances. In the second place, such a catalogue makes us feel vicariously alert; we participate in the extraordinary responsiveness of Doctor Doolittle’s dog, and so feel the more alive to things. In the third place, we exult in Jip’s power of instant designation, his ability to pin things down with names as fast as they come. The effect of the passage, in short, is to let us share in an articulate relishing and mastery of phenomena in general. praise him, and magnify him for ever. ye the Lord: praise him, and magnify him for ever. I needn’t go on to the close, because I am sure that you all know the logic of what follows. All the works of the Lord are called upon in turn – the sun, moon, and stars, the winds and several weathers of the sky, the creatures of earth and sea, and lastly mankind. There is nothing left out. The canticle may not speak of crushed laurel-leaves and sycamores, but it does say more comprehensively, “O all ye Green Things upon the Earth, bless ye the Lord”; it may not speak of foxes and of young cows in a mountain stream, but it does say “O all ye Beasts and Cattle, bless ye the Lord.” What we have in the Benedicite is an exhaustive poetic progress from heaven, down through the spheres of the old cosmology, to earth and man at the center of things – a progress during which the whole hierarchy of creatures cited in terms which, though general, do not seem abstract. It is a poem or song in which heaven and earth are surrounded and captured by words, and embraced by joyous feeling. He fathers-forth whose beauty is past change: Praise him. As in the old canticle, God is praised first and last; but what lies between is very different. Hopkins does not give us an inventory of the creation; rather he sets out to celebrate one kind of beauty – pied beauty, the beauty of all things which are patchy, particolored, variegated. And in his tally of variegated things there is no hierarchy or other logic: his mind jumps, seemingly at random from the sky to trout to chestnuts to finches, and finally, by way of landscape, to the gear and tackle of the various trades. The poem sets out, then, to give scattered examples of a single class of things; and yet in its final effect this is a poem of universal praise. Why does it work out that way? It works that way, for one thing, because of the randomness which I have just pointed out; when a catalogue has a random air, when it seems to have been assembled by chance, it implies a vast reservoir of other things which might just as well have been mentioned. In the second place, Hopkins’s poem may begin with dappled things, but when we come to “gear and tackle and trim,” the idea of variegation is far less clean, and seems to be yielding to that of character. When, in the next line, Hopkins thanks God for “All things counter, original, spare, strange,” we feel the poem opening out toward the celebration of the rich and quirky particularity of all things whatever. And that a kelson of the creation is love. And brown ants in the little wells beneath them. That passage happens to proceed from God to man to nature, but there is nothing hierarchical in its spirit. Quite the contrary. This is the Whitman, “I do not call one greater and one smaller…The insignificant is as big to me as any.” He speaks in the same rapt voice of men and women and moss and pokeweed, and it is clear that he might have spoken to the same purpose of ducks or pebbles or angels. For Whitman, as for the Zen Buddhist, one thing is as good as another, a mouse is sufficient “to stagger sextillions of infidels,” and any part, however small, includes by synecdoche the wonder of the whole. In our own immediate date there would be David Jones, Theodore Roethke, and Ruthven Todd in their later work; and indeed there have been poets in all lands and ages who have sought to resume the universe in ordered categories, or to suggest its totality by the causal piling-up of particulars. But I’ve given enough examples already, and my aim here is not to make a catalogue of poetic catalogues, but to suggest by a few illustrations that the itch to call the roll of things is a major motive in the writing of poetry. Whether or not he composes actual catalogues like Whitman or Hopkins, every poet is driven by a compulsion to designate, and in respect of that drive the poet is not unlike people in general. We all want to be told, for no immediate practical reason, whether a certain column is Ionic or Corinthian, whether that cloud is stratus or cumulus, and what the Spanish word for “grocer” is. If we forget the name of a supporting actor in some film, or the roster of our Supreme Court bench, we are vexed and distracted until we remember, or look it up in some book of reference. If we travel to the tropics for the first time, and find ourselves surrounded not with oaks and maples but with a bristling wall of nameless flora, we hasten to arm ourselves with nature-books and regain our control over the landscape. He was right to be excited, I think. Duff is a short, precise word which somehow sounds like what it means, and it is a word which poets must often have groped after in vain. My own recent discovery of that kind is the term for the depression in the centre of one’s upper lip. It had annoyed me, on and off, for many years that I had no word for something that was literally under my nose; then at long last I had the sense to inquire a Dentist. He told me that the word is philtrum, deriving from the Green word for “love-potion,” and implying, I should think, that the upper lip is an erogenous zone. That sort of word-hunting and word-cherishing may sound frivolous to some, and it must be admitted that the poet’s fascination with words can degenerate into fetishism and the pursuit of the exotic. More often, however, such researches are the necessary, playful groundwork for that serious business of naming which I have been discussing. Not all poets, especially in the present age, can articulate the universe with a Benedicite, or possess it by haphazard mysticism, but every poet is impelled to utter the whole of that world which is real to him, to respond to that world in some spirit, and to draw all its parts toward some coherence. The job is an endless one, because there are always aspects of life which we acknowledge to be real, but have not yet truly accepted. The urge of poetry is not, of course, to whoop it up for the automobile, the plane, the computer, and the space-ship, but only to bring them and their like in to the felt world, where they may be variously taken, and to establish their names in the vocabulary of imagination. One perpetual task of the poet is to produce models of inclusive reaction and to let no word or thing be blackballed by sensibility. That is why I took large pleasure, some years ago, in bringing off a line which convincingly employed the words “reinforced concrete.” And that is why William Carlos Williams, with his insistence on noting and naming the bitterest details of the American urban scene, was such a hero of the modern spirit; he would not wear blinders in Rutherford and Patterson but instead wrote beautifully of peeling billboards, wind-blown paper bags, and broken bottles in the gravel, claiming for poetry a territory which is part of our reality, and needs to be seen and said. For poetry, there is no such thing as no-man’s-land. The drive to get everything said is not merely a matter of acknowledging and absorbing the physical environment. The poet is also moved to designate human life in all its fullness, and it may be argued, for an extreme example, that the best part of Henry Miller arises from a pure poetic compulsion to refer to certain realities by their real names. Mr. Miller’s best is not very good, actually, and Aretino did it far better some centuries back; but there are passages in the Tropics which are clearly attempting, by means of an exuberant lyricism, to prove that the basic four-letter words are capable of augmenting our literary language without blowing it to pieces. I expressed this view not long ago, when testifying for Mr. Miller at an obscenity trial, and the judge replied only with a slow, sad shaking of the head. But I remain unshaken. I don’t think that Mr. Miller succeeds very often in his aim, partly because the words he champions are what the theater calls bad ensemble players. But as for his aim, I recognize it as genuine and would call it essentially poetic. Thus far I have been speaking of poetry as an inventory of external reality; now let me speak of poetry as discovery and projection of the self. The notion that art is self-expression, the expression of one’s uniqueness, has provoked and excused a great deal of bad, solipsistic work in this century; nevertheless, the work of every good poet may be seen in one way or another as an exploration and declaration of the self. Those lines are a pure trophy of introspection; they are not the re-phrasing of something known, but the articulation of one person’s intense inward observation. Yet because they are so articulate and so true, they light up both the poet’s psychology and everyone else’s. Another version of self-discovery is implied in Edwin Muir’s statement that “the task of a poet is to make his imaginative world clear to himself.” What Muir meant was that every poet, owing to his character and early life, has a predisposition to project his sense of things by telling this or that story, by using this or that image or symbol. It may take a poet years to stumble on his destined story or symbol and set it forth, but for Muir they are always vaguely and archetypally there, at the back of the poet’s mind. As I have said, these moments of self-possession can be a long time in coming. Looking back at his early poems, and finding them cloudy and abortive, Yeats sadly wrote in his autobiography, “It is so many years before one can believe enough in what one feels even to know what the feeling is.” It was late in his life that a Scots poet whom I knew, while buckling his belt one morning, heard himself saying the Lord’s Prayer, and concluded that he must be a Christian after all. Or to speak of a deconversion, there were eight years of silence between the clangorous, prophetic early books of Robert Lowell and the publication of Life Studies, in which a flexible worldly voice suddenly speaks, with a whole personality behind it. What happened to Lowell was, in Yeats’s phrase, a “withering into the truth,” and some such process must occur, I think, in the life of every poet. What is literature but the expression of moods by the vehicle of symbol and incident? And are there not moods which need heaven, hell, purgatory and faeryland for their expression, no less than this dilapidated earth? Now, Yeats had his sea-birds too, and in his youthful novel John Sherman there were some puffins very accurately observed; but soon he became concerned, as he said, with “passions that had nothing to do with observation,” and the many birds of his subsequent work are a symbolic aviary of no descriptive interest. Yeats rarely gives us any pictorial pleasure, in birds or in anything else, being little concerned in his naming of things to possess them in their otherness and actuality. Nevertheless he, like all poets, is a namer; and Miss Bishop, for all her descriptive genius, is like all poets a scholar of the heart. It is a matter of proportion only, a matter of one’s imaginative balance. That is an observation about life in general, but above all it applies to poetry. We are happy as poets, Yeats says, when our thoughts and feelings have originals or counterparts in the world around us — when there is a perfect conversancy or congruence between self and world. In Yeats’s poetry, the chief symbol for such happiness is the marriage-bed, and his artful lovers Solomon and Sheba, each striving to incarnate the other’s dream, represent the mutual attunement of imagination and reality. Keats’s lovers Madeline and Porphyro, in “The Eve of St. Agnes,” accomplish the same miracle and symbolize the same thing; each, without loss of reality, becomes the other’s vision, and the poem is one solution to Keats’s continuing enquiry into the right balance between vision and everyday experience. Elsewhere he employs or espouses other formulae, as in the poem “To Autumn,” where imagination does not transmute and salvage the world, but rather accepts it in all its transient richness, and celebrates it as it is. It doesn’t trouble him, Frost says, that the brook on his farm runs dry by June, and becomes a gulley full of dead leaves and jewelweed; it may not be Arethusa or smooth-sliding Mincius; it may not, like Tennyson’s brook, go on forever; but it has real and memorable beauties that meet his desire. Loving it for what it is, the poet does not try to elevate his subject, or metamorphose it, or turn it into pure symbol; it is sufficient that his words be lovingly adequate to the plain truth. In another and comparable poem called “Mowing,” Frost builds towards a similar moral: “The fact is the sweetest dream that labor knows.” One doesn’t think of Wallace Stevens, who so stressed the transforming power of imagination, as having much in common with Frost, and yet Stevens would agree that the best and happiest dreams of the poet are those which involve no denial of the fact. In his poem “Crude Foyer,” Stevens acknowledges that poets are tempted to turn inward and conceive an interior paradise; but that is a false happiness; we can only, he says, be “content, /At last, there, when it turns out to be here.” We cannot be content, we cannot enjoy poetic happiness, until the inner paradise is brought to terms with the world before us, and our vision fuses with the view from the window. Regardless, then, of subjective bias or of a reverence for fact, poets of all kinds agree that it is the pleasure of the healthy imagination to achieve what Stevens called “ecstatic identities with the weather.” When the sensibility is sufficient to the expression of the world, and when the world, in turn, is answerable to the poet’s mind and heart, then the poet is happy, and can make his reader so. Now, if I were satisfied with my use of the word world, which I have been saying over and over in an almost liturgical fashion, I might feel that I had come near to the end of my argument. But world, in contemporary usage, is a particularly sneaky and ambiguous term. I see that I must try to use it more precisely, and that once I have done so there will be more to say. What might I mean by world? I might mean what Milton meant when he spoke of “this pendant world”; that is, I might mean the universe. Or I might mean the planet Earth; or I might mean the human societies of Earth, taken together. Or if I defined world by reference to the soul or self, I might mean what a German philosopher called the “Non-Ego,” or what Andrew Wyeth meant when he called one of his paintings “Christina’s World.” I am sure that you have all seen that touching painting of Wyeth’s: it shows us a crippled girl sitting in a field of long grass, and looking off toward a house and barn; her “world” consists of what she can see, and the desolate mood in which she sees it. Literary critics, nowadays, make continual use of the word world in this last sense. They write of Dylan Thomas’s world of natural process, Conrad Aiken’s world of psychic flux, John Ransom’s gallant and ironic world of the South, or the boy-ish, amorous, and springtime world of e. e. cummings. Any of us could assign a “world,” in this sense, to any poet whose work we know; and in doing so, we would not necessarily be blaming him for any narrowness of scope. Robinson Jeffers on his mountaintop by the Pacific, writing forever of hawks and rocks and of the violent beauty of nature, was not prevented from speaking, through his own symbols and from his own vantage, of God and history and cities and the passions of men and women. Like any good poet of this American century, he found images and symbols which could manifest the moods of his heart, and elected a world of his own through which the greater world could someway be seen and accounted for. I bring up Dante not merely to belabor the present with him, but because there is something which needs to be explained. We are talking of poetry as a mode of pursuing happiness; we live in a century during which America has possessed many poets of great ability; nevertheless, it is no secret that the personal histories of our poets, particularly in the last thirty years, are full of alcoholism, aberration, emotional breakdowns, the drying-up of talent, and suicide. There is no need to learn this from gossip or biography; it is plainly enough set down in the poetry of our day. And it seems to me that the key to all this unhappiness may lie in the obligatory eccentricity, nowadays, of each poet’s world, in the fact that our society has no cultural heart from which to write. Alberto Moravia, in a recent article on a great American writer and suicide, Ernest Hemingway, describes our country as “a minor, degraded and anti-humanistic culture,” and observes that our typical beginning novelist, lacking any faith in the resources of culture, “confines himself to recounting the story of his youth.” Having done so once successfully, the novelist proceeds for lack of any other subject to do it again and again, and, as Moravia puts it, “mirrors increasingly, in the mechanization of his own work, the mechanization of the society for which he is writing.” I am sorry to say that I cannot brush aside Signor Moravia’s general judgment upon us. I wish that I could. One can protest that not all of our novelists are the prisoners of their own early lives, and that most of our poets are cultured in the sense of being well schooled in the literary and artistic tradition. But one cannot deny that in the full sense of the word culture — the sense that has to do with the humane unity of a whole people — our nation is impoverished. We are not an articulate organism, and what most characterizes our life is a disjunction and incoherence aggravated by an intolerable rate of change. It is easy to prophesy against us. Our center of political power, Washington, is a literary and intellectual vacuum, or nearly so; the church, in our country, is broken into hundreds of sorry and provincial sects; colleges of Christian foundation hold classes as usual on Good Friday; our cities bristle like quartz clusters with faceless new buildings of aluminum and glass, bare of symbolic ornament because they have nothing to say; our painters and sculptors despair of achieving any human significance, and descend into the world of fashion to market their Coke-bottles and optical toys; in the name of the public interest, highways are rammed through old townships and wildlife sanctuaries; all other public expenditure is begrudged, while the bulk of the people withdraw from community into an affluent privacy. I could go on with such sweeping assertions, and soon, no doubt, I would go too far, and would have to admit that anarchy is not confined to America, and that here or there we have the promise of cultural coherence. But I would reluct at making too much of the present boom in education, or the growth of regional theaters and symphony orchestras. Such things may be good in themselves, but they are not the kind of culture I am talking about. Houston has an admirable symphony orchestra, but the nexus of human relations in that city is the credit card, and where art does not arise from and nourish a vital sense of community, it is little more than an incitement to schizophrenia. The main fact about the American artist, as a good poet said to me the other day, is his feeling of isolation. To Dante, at the other extreme, the world appeared as one vast society, or as a number of intelligibly related societies, actual and spiritual; his Commedia was the embodiment and criticism of a comprehensive notion of things that he shared with his age. Or think, if you will, of the sure sense of social relevance with which Milton embarked on the writing of an epic poem which was to be “exemplary to a nation.” Or think of that certainty of the moral consensus which lies behind the satires of Alexander Pope, and makes possible a wealth of assured nuance. How often, I wonder, has an American poet spoken so confidently from within the culture? I began by distinguishing two ways of understanding the word poetry: first, as verse compositions written by individuals, and second, as that ensemble of articulate values by means of which a society shapes and affirms itself. It is the natural business of the first kind of poetry to contribute to the second, clarifying, enriching and refreshing it; and where the poet is unable to realize himself as the spokesman and loyal critic of an adequate culture, I think that his art and life are in some measure deprived of satisfaction and meaning. To be sure, every poet is a citizen of the Republic of Letters, that imaginary society whose members come from every age and literature, and it is part of his happiness to converse, as it were, with the whole of tradition; but it is also his desire to put his gift at the service of the people of his own time and place. And that, as I have been saying, is a happiness not easily come by in contemporary America. It is possible, however isolated one may feel, to write out of one’s private experiences of nature or God or love; but one’s poetry will reflect, in one way or another, the frustration of one’s desire to participate in a corporate myth. In some of our poets, the atomism of American life has led to a poetry without people, or an art of nostalgia for childhood. Elsewhere, we find a confessional poetry in which the disorder and distress of the poet’s life mirrors that cultural disunity to which he, because of his calling, is peculiarly sensitive. When the poet addresses himself directly to our society, these days, it is commonly in a spirit of reproach or even secession, and seldom indeed in a spirit of celebration. I do not hold the poet responsible for that fact. At the close of one of his eloquent poems, Archibald MacLeish exhorts the modern poets to “Invent the age! Invent the metaphor!” But it is simply not the business of poets to invent ages, and to fashion cultures singled-handed. It may be that Yeats’s Ireland was in good part Yeats’s own invention, and he may have made some of it stick; but America is too huge a muddle to be arbitrarily envisioned. The two modern poets who tried to put a high-sounding interpretation on our country — Lindsay, whose Michigan Avenue was a street in Heaven, and Crane, whose Brooklyn Bridge leapt toward our spiritual destiny — ended by taking their own lives. Now, all I wanted to say was that the poet hankers to write in and for a culture, countering its centrifugal development by continually fabricating a common and inclusive language in which all things are connected. But I got carried away by the present difficulty of attaining that happy utility. Of course I have overstated the matter, and of course there are fortunate exceptions to be pointed out. Robert Frost was strongly aware of the danger that accelerating change might sweep our country bare of all custom and traditional continuity; some of his best poems, like “The Mountain,” are about that threat, and it is significant that he defined the poem as “a momentary stay against confusion.” Frost staved off confusion by taking his stand inside a New England rural culture which, during the height of his career, still possessed a certain vitality, and remains intelligible (if less vital) today. In general I should say that Frost assumed, rather than expounded, the governing ideas and ideals of that culture; but that, after all, is the way of poetry with ideas. It does not think them up; it does not argue them abstractly; what it does is to realize them within that model of felt experience which is a poem, and so reveal their emotional resonance and their capacity for convincing embodiments. I was looking the other day at what is doubtless the best-loved American poem of this century, Robert Frost’s “Birches,” and it occurred to me that it might be both pertinent and a little unexpected if I finished by quoting it and saying one or two things about it. To begin with, this poem comes out of the farm and woodland country of northern New England, and everything in it is named in the right language. Moreover, there are moments of brilliant physical realization, as when the breeze “cracks and crazes” the “enamel” of ice-laden birches, or the birch-swinging boy flings out and falls in a perfect kinetic line, “Kicking his way down through the air to the ground.” The poem presents a vivid regional milieu, and then subtly expands its range; naturally, and almost insensibly, the ground and sky of New England are magnified into Heaven and Earth. Considered as self-projection, “Birches” is an example of how the pentameter can be so counter-pointed as to force the reader to hear a sectional and personal accent. Frost’s talking voice is in the poem, and so too is his manner: the drift of the argument is ostensibly casual or even whimsical, but behind the apparent rambling is a strict intelligence; the language lifts into rhetoric or a diffident lyricism, but promptly returns to the colloquial, sometimes by way of humor. The humor of Frost’s poem is part of its meaning, because humor arises from a sense of human limitations, and that is what Frost is talking about. His poem is a recommendation of limited aspiration, or high-minded earthliness, and the birch incarnates that idea perfectly, being a tree which lets you climb a while toward heaven but then “dips its top and sets you down again.” This is a case in which thought and thing, inside and outside, self and world, admirably correspond. Because of his colloquialism and his rustic settings, Frost has often been thought of as a non-literary poet. That is a serious error. Frost was lovingly acquainted with poetic literature all the way back to Theocritus, and he was a conscious continuator and modifier of the tradition. Formally, he adapted the traditional meters and conventions to the natural cadence and tenor of New England speech. Then as for content, while he did not echo the poetry of the past so promiscuously as T.S. Eliot, he was always aware of what else had been written on any subject, and often implied as much. In “Hyla Brook,” which I read to you a few minutes ago, Frost makes a parenthetical acknowledgement that other poets — Tennyson, Milton, Theocritus perhaps — have dealt more flatteringly with brooks or streams than he feels the need to do. The massy earth and spheréd skies are riven!